Sandi Sonnenfeld is the author of the memoir This is How I Speak and her fiction and essays have appeared in more than 30 publications including Sojourner, Raven Chronicles, ACM, Peregine, Mr. Bellers’ Neighborhood, and Hayden’s Ferry Review among others. She holds an MFA in Fiction Writing from the University of Washington, where she studied under National Book Award Winner Charles Johnson, and was named a 2002 Celebration Author by the Pacific Northwest Booksellers Association, which recognizes those writers whose work merits special attention. 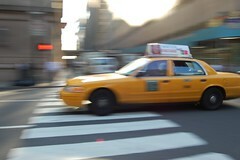 “Taxi Driver” originally appeared in the August 2010 issue of The Storyteller. I wanted to ask him how she came to have a black eye, but was afraid he might tell me. The reason I imagined was worse enough. I hadn’t even looked at the cabbie when I first scooted into the taxi. The office receptionist had arranged for a cab to meet me downstairs and after handing the driver my luggage to put in the trunk, I’d slid into the back seat gratefully, knowing I was finally heading home. Inherently introspective in a field where gregariousness mattered instead, I often had to gear myself up to play the role that being Director of Public Relations at a 14-office mega law firm demanded – part firm cheerleader, part crisis manager, part business adviser, even part-time shrink, listening empathetically, and with the utmost discretion, to every perceived slight an attorney endured from his fellow partners, providing reassurance that her practice mattered to the firm (after all, hadn’t I traveled all this way just to meet with her, to train him how to interact positively with the media, identify effective methods to market her capabilities and legal insights to secure new clients – leadership wouldn’t invest in me, and thus in her, if she, he, wasn’t valued). My brain was foggy from lack of sleep and in trying to process all the information I had gathered in my two days down in Houston. Indeed, I was only half listening as I thumbed the wheel of my Blackberry to scan my emails, a nasty habit that I didn’t seem able to break, when he asked me where I was from. “New York,” I said, frowning at the latest message from one of my staff in Los Angeles. I really do like living in New York, for those reasons and countless others, but I answered as if by rote, hoping that he would sense my desire for quiet, to not talk, so I could wring out my crowded sponge of a brain, let all my commitments and responsibilities drain away—a thirty minute respite en route to the George H.W. Bush Airport. I drew a deep breath, put down my Blackberry, and looked out the window. H.W. For some reason I always thought of Herbert Hoover when I saw those initials—of the Hoovervilles depicted so vividly in Sullivan’s Travels or The Grapes of Wrath—tents and shanty houses with rusted aluminum roofs to keep the rain away even as the night winds blew into knot holes of discarded wood that Depression-poor fathers dragged from rail yards and deserted construction sites to make some semblance of shelter for their cold, starving families. They built these shanties right beside the railroad tracks, so they could hear the lonely whistle of a freight train miles before it arrived, giving them time to figure out how they could open up a few of the storage cars and steal whatever food or supplies they might find. But thievery didn’t sit so well with some of these men, many of whom just a few months earlier owned a farm or ran a dry goods store, so often instead they would hop aboard the next train going West, towards the warmth of California, hoping that distance would eradicate the exhausted, despairing faces of their wives, fade the memory of children whose lips and fingers had turned blue from chillblains. I would think of Hoovervilles and fathers and children and then wonder what our current President–whose popularity ratings ranked even lower than Mr. Hoover’s had–thought when he traveled home to an airport named for his father, a man himself who fell from grace after only four years in office. I looked out the window as my mind flirted with these thoughts, never quite carrying any of the arguments through, uncertain as always about the facts, raised as I was, like most of my generation, on thirty-second sound bites and an understanding of history that came not from teachers or books but years of watching old movies on late night television. Not that it mattered, as if anyone in Bush-loving Houston cared to listen to my half-baked theories. The cabbie is asking me a question. “You mean at the restaurants? Of course. Fish and lobster, crab, mussels, shrimp. And oysters. New York was once the oyster capital of the world. But that was a long time ago,” I said. Did New York have crayfish? Didn’t New York have everything that money could buy? Personally, I didn’t care for seafood all that much. For the first time, I glanced at the hack license posted to the Plexiglas partition that separated me from him. His name was Leroy. Leroy Smith. His Department of Motor Vehicles photo made him look like an ax murderer: acne-scarred coppery skin, a dark mass of curly hair and tight, closed features. I looked from the photo to the back of his head. His eyes met mine in the rearview mirror. They were bright, expectant, soft and brown as a deer’s coat. He nodded his head. That’s when he began to tell me about how he got a job driving a bus in New Orleans after Hurricane Katrina struck. About the half-clothed girl with the black eye. I thought about the video footage that had run day after day on TV. Thirsty, terrified dogs and cats stuck up on the roofs of houses that floated down rivers that once had been streets. Cars overturned, mud everywhere, people crammed into attics, holding on to anything they could find, so the flood wouldn’t sweep them away. The rows and rows of cots set up on the floor of the New Orleans Astrodome. Then the later reports of not enough toilets, no potable water, little food, women and girls being raped. The bedridden in hospitals left to die. Fathers who were never heard from again. Children looking for their mothers. Looking for their uncles, their aunts, for anyone who knew them before the levees broke. Even today, all these years later, the pictures remain imprinted on my brain. Even today, when I think about it, when someone like Leroy makes me think about it, I feel a sharp stabbing in my chest. “What made you go there?” I asked. “That’s a long time,” I said. I didn’t ask where he showered or went to the bathroom. I tried to imagine myself sleeping on a bus, transporting people who had nothing left, often not even someone who knew their name, for ten, fifteen, twenty hours a day. I tried to imagine what kind of life Leroy had led before Katrina that he would consider a particle board bed and twenty-four hour access to meals ‘great’, that he could accept life’s challenges so easily. One of the reasons I had gone to Houston was to talk to the partners about some of the challenges our law firm faced in the wake of the subprime meltdown and subsequent credit crunch. Two weeks earlier Bear Sterns had been gobbled up whole by Morgan Stanley for two dollars a share with the blessing of the Federal Reserve. Thousands of Wall Street workers were suddenly jobless. Most of the Houston lawyers I spoke to were taking it in stride, talking about how business cycles work, how given our strong energy and technology practices we would probably make it through better than many of our competitors. Still the word “recession” was on everyone’s lips—there was talk about right-sizing, cost-cutting, trimming the fat until the financial markets could recover. I had been careful not to ask firm leadership if my marketing colleagues and I would soon be classified as part of the fat. Leroy said he often picked up passengers at the same building where he had met me, and lots of them worked for lawyers. Just the other day, he said, one woman, a secretary, had told him that the partners she worked for charged five hundred dollars an hour. “Is that true?” he asked. His voice was free of judgment, no outrage, no trite joke about bottom-feeding lawyers that I often heard when people learned of my career. He was simply filled with a sheer sense of wonder, marveling that such a thing could be, like an excited child asking whether it was possible that life existed on Mars. Leroy pulled into the departure terminal at the airport. My fare came to forty-four dollars and eleven cents. I signed the voucher my firm gave me, then handed Leroy a twenty-dollar bill for the tip, knowing I would never expense it back to the office. I gave him twenty dollars for all the people who couldn’t afford to do so, for the young girls with the blackened eyes and the screaming babies they carried in their arms, for the hundreds and hundreds of hurricane survivors Leroy transported from New Orleans to unknown and uncertain futures. For the secretaries, the filing clerks, the middle managers at Bear Sterns who no longer had jobs. For the Hooverville children foraging for food in the dirty ground by the railroad and for their great grandchildren who grew up in a country where lawyers can charge five hundred dollars an hour for advice, yet somehow produces a government that seemingly lacks the money and foresight to fix faulty levees or cares enough to evacuate the poor. For what Leroy did to rescue the survivors, and for seeing some place besides the South for the first time in his life, for reminding me that this is also a country where an extraordinary working man like Leroy could find great satisfaction just in having someone to talk to while he drives his cab and a place to lay his head at the end of a long, tiring day. I handed him twenty dollars which could, would, never be enough for what he had just given me. As I gathered my things up to exit the taxi, Leroy asked me one last question. Copyright Sandi Sonnenfeld, 2011. All rights reserved. This entry was posted in Creative Nonfiction, Featured Work and tagged Houston, Hurricane Katrina, New Orleans, Taxicab by Sandi Sonnenfeld. Bookmark the permalink.